The London Bed by Get Laid Beds combines a traditional look of a wooden bed with elegance and practicality to ensure that this is the ultimate blend for any bedroom. In comparison with other bed frames within the range, this bed features a wider footboard yet still provides excellent clearance underneath the bed to ensure that this bed can offer additional storage. The solid headboard provides additional comfort and support and ensures that the London Bed is one of our best selling beds with a sturdy and well constructed frame. The London Bed by Get Laid Beds is made from solid Scandinavian pine as standard and this pine option is available with a wide variety of different stains to choose from which include the classic rose red, the traditional looking sandy stain and of course, the timeless white or white wash stains. 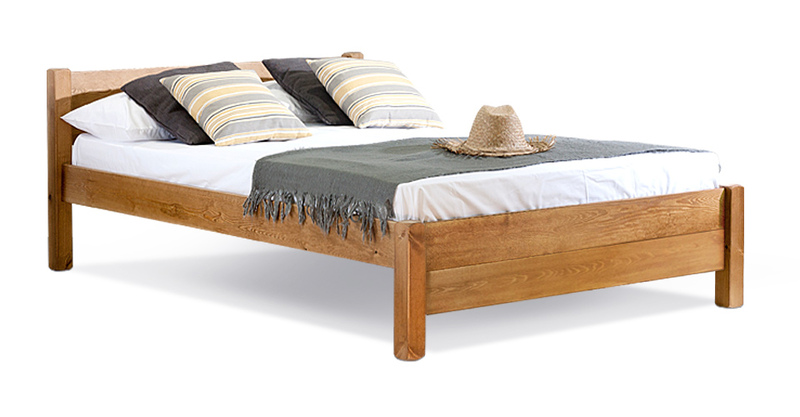 Get Laid Beds also has the upgraded option of having hardwoods available such as oak, walnut and beech which would add an even more luxurious and traditional feel to this handmade wooden bed frame. All of the beds within the Get Laid Beds range are handmade to order – this enables that should you require an alteration or adjustment in the sizing for a particular requirement the bespoke manufacturing facility enables Get Laid Beds to customise the bed and tailor make it to your exact needs. These custom size and alteration options can include increasing or decreasing the clearance, the width or the length to ensure that no matter the space, you can get your ideal bed frame to fit. Please quote this Products's code 10007B to speed up your query if related. by Get Laid Beds combines a traditional look of a wooden bed with elegance and practicality to ensure that this is the ultimate blend for any bedroom. In comparison with other bed frames within the range, this bed features a wider footboard yet still provides excellent clearance underneath the bed to ensure that this bed can offer additional storage. The solid headboard provides additional comfort and support and ensures that the London Bed is one of our best selling beds with a sturdy and well constructed frame.